Greetings and love from Washington, DC, the capital of the United States, which should be on every traveler's radar. Founded on July 16, 1790, it is an amazing city with a rich history in which to submerse oneself. Architecturally stunning the city is a diverse blend of historic and contemporary design. For visitors the city has much to experience from learning about the history of the United States to visiting its many historic sites, attractions, and museums. 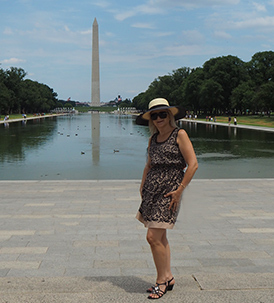 We visited Washington, DC in July 2018, 228 years after its founding, and it is a city that is made for walking and discovering its wonderful facets, so wear a pair of comfortable shoes and "join us" as we bring you some of the highlights of the city. We stayed at the stunning Fairmont Washington, DC, Georgetown, which has all the bells and whistles that one would expect in a luxury hotel and then some. Located in the desirable West End, the hotel is an attractive blend of contemporary elegance and gracious hospitality. Sumptuous, well-appointed accommodations, Juniper, their gourmet restaurant, Balance Gymwith a plethora of fitness options including CrossFit, Zumba, Yoga, Barre, Pilates, Spin, Boxing, and more, indoor saltwater pool, whirlpool, sauna, steamrooms, business center, complimentary bicycles, and the Gold Floor for guests who want a more personalized experience, make it perfect for the business or leisure traveler. With its desirable location in the fashionable West End and its close proximity to many of Washington, DC's historic sites and attractions the Fairmont Washington, DC, Georgetown is the perfect "home-away-from-home" for business or leisure travelers. 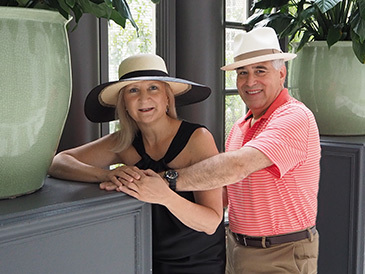 Read more about our stay at the Fairmont Washington, DC, Georgetown in the Hotels and Resorts section. 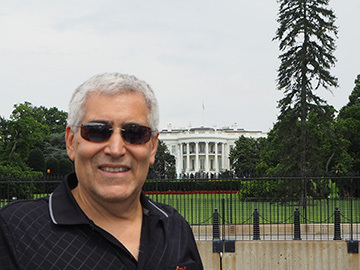 A trip to Washington, DC would not be complete without a photo op of the White House. Built between 1792 - 1800 in the late Georgian style serves as the official residence and workplace of all United States Presidents. 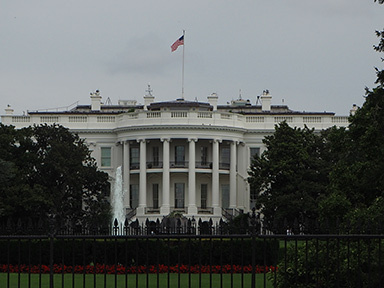 Every president except for George Washington has used the White House. The National Mall is home to the Washington Memorial, a soaring 555-foot marble obelisk crowned with a 9-inch pyramid of cast aluminum, dedicated in 1885 to honor George Washington, the first President of the United States. If you saw the 1994 American movie, Forrest Gump, you may remember seeing the Washington Monument and the Reflecting Pool where Jenny (Robin Wright) waded in the water to meet Forrest (Tom Hanks). 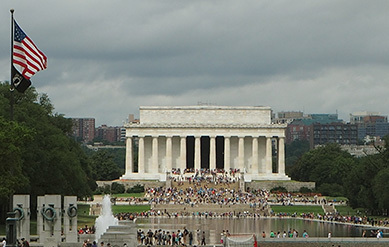 The Lincoln Memorial is located on the Western end of the National Mall. Built between 1914 - 1922, the 99-foot Greek Revival building was designed by architect Henry Bacon. Interesting building details: Massachusetts granite used on the terrace level, Colorado marble used on the upper steps and the outside façade, Tennessee pink marble used on the chamber floor, Indiana limestone used on the interior walls and chamber columns, and Alabama marble used on the ceiling tiles. The 36 columns represent the states in the Union at the time of his death and inscribed at the top of the building are the names of the states. The memorial houses the impressive statue of President Abraham Lincoln measuring 19-feet high and 19-feet wide created by Sculptor David Chester French and carved from Georgia marble. 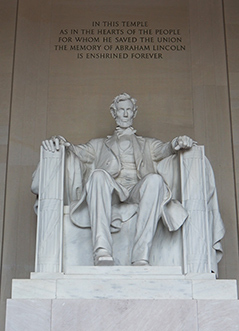 Written above the statue are the words, "In this temple as in the hearts of the people for whom he saved the union, the memory of Abraham Lincoln is enshrined forever." 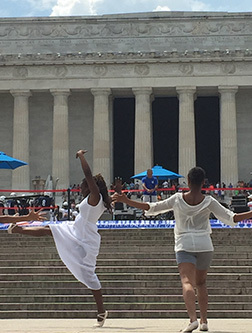 During our visit, there was a wonderful dance performance by aPART: Inclusive Arts Initiative directed by Dance Instructor and Choreographer Paij A. Hardy, part of the "Darryl Haley Presents : Music at the Monument" at the Lincoln Memorial. 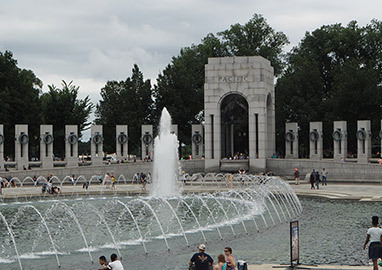 The War Memorials (World War II Memorial, Korean War Veterans Memorial, Vietnam Veterans Memorial) are especially heart rendering. Whenever we visit Washington, we always make a stop to honor our nation's veterans, thanking them for their service to the country. Washington, DC is a city with an abundance of museums to appeal to diverse interests, including 11 admission-free grand-scale Smithsonian Museums located on the National Wall and 6 additional admission-free Smithsonian museums and a zoo in the greater National Capital area providing visitors with endless opportunities to happily spend many hours making their discoveries, especially perfect on inclement days. Washington, DC has a castle! The Smithsonian Institution Building (The Castle) designed by James Renwick, opened in 1855 and houses the Smithsonian Visitor Center that provides information on James Smithsonian and the history of how the museums came to be, along with interesting collections. The Castle is open daily from 8:30 am until 5:30 pm and is admission-free. 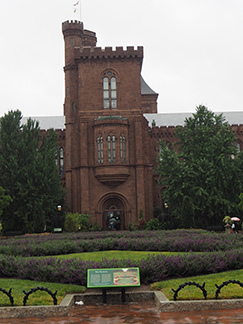 Although it was raining, we did take a few minutes to stroll the beautiful Enid A. Haupt Gardens adjacent to the castle. 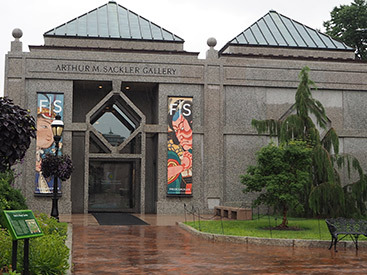 Located on the National Mall next to the Smithsonian Castle is the Freer Gallery of Art, that together with the Arthur M. Sackler Gallery of Art located at 1050 Independence Avenue, SW comprise the Freer Sackler Museum "where Asia meets America." A few of the many highlights included the sumptuously ornate blue and gold Peacock Room that was once the dining room of Frederick Richards Leyland of Liverpool, England on permanent exhibition, and the special exhibit "To Dye For" - Ikats from Central Asia (until July 29, 2018), which featured exquisite wall hangings and clothing including elaborate haute couture designs by the renowned designer Oscar de la Renta. In addition to the impressive collections, allow time to relax and absorb the tranquil setting of the attractive courtyard with fountain. The museum is open daily from 10:00 am until 5:30 pm and is closed on December 25 and is admission-free. 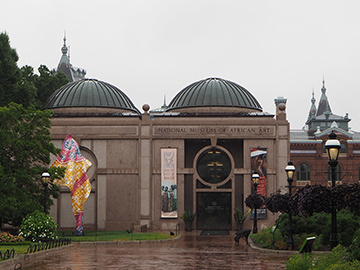 The National Museum of African Art is also located across from the castle and features an impressive collection of traditional and contemporary African Art. 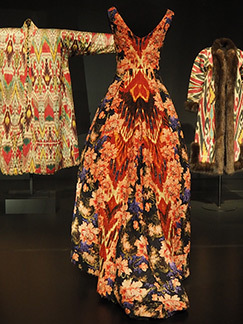 Especially notable is The Walt Disney Tishman African Art Collection. 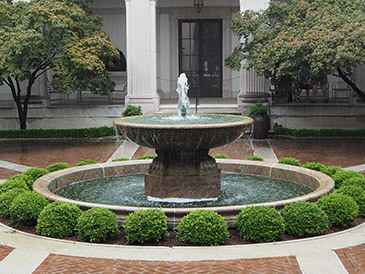 The Hirschorn Gallery and Sculpture Garden features contemporary and modern art. Its impressive cylindrical building was designed by American Architect Gordon Bunshaft (1909 - 1990) and opened in 1974. 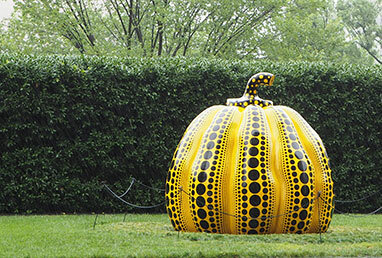 Be sure to make time to stroll the grounds and see their large-scale sculpture garden after visiting the museum. One of the many highlights was the temporary exhibition, Baselitz: Six Decades (on exhibit until September 16, 2018), featuring Georg Baselitz's famous upside-down paintings which has the viewer looking at art differently. The museum is open daily from 10:00 am until 5:30 pm and is closed on December 25. The Sculpture Garden is open daily from 7:30 am until dusk. Daily tours at 12:30pm. The museum and garden and admission-free. 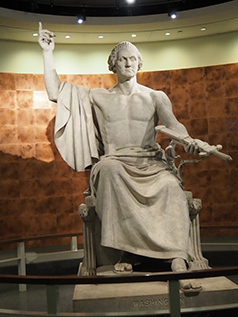 National Museum of American History - so much to see, so little time to see it all! 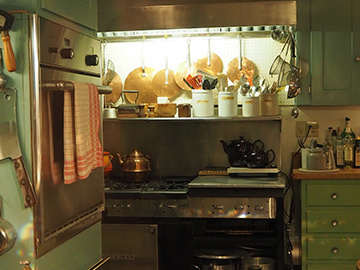 A few of the many highlights of our visit included seeing the collection of First Ladies' gowns and china, the kitchen of Julia Child who changed the way Americans cook and eat, and various forms of transportation including planes, trains, automobiles, and even boats. Its many interactive hands-on exhibits will appeal to all ages. 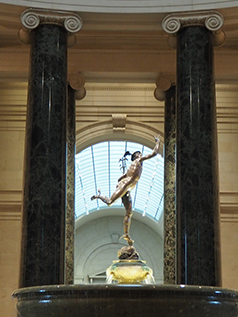 The National Gallery of Art is another treasure trove of art and sculptures where we happily spent a few hours and could have spent days exploring its vast collection. The ornate rotunda in the West Wing features an impressive bronze of Mercury atop a fountain encircled by soaring black columns. A few of the many highlights of the museum include the paintings by daVinci, Vermeer, Rembrandt, and Van Gogh, the Degas bronzes, sculpture by Auguste Rodin, and Pietro Magni's exquisite marble masterpiece, "Reading Girl" (La Leggitrice) modeled in 1856 and carved in 1861. The museum is open from Monday - Saturday from 10:00 am until 5:00 pm, and Sunday from11:00 am until 6:00 ppm. The Gallery is closed December 25 and January 1. The gallery is admission-free. 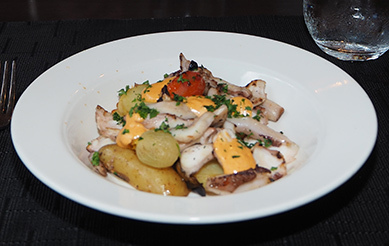 Located on the first floor of the Fairmont Washington, D.C., Georgetown in the Foggy Bottom district, the restaurant Juniper has its own entrance, and can also be accessed from within the hotel. Executive Chef Jordi R. Gallardo and Sous Chef Mitchell Eldridge are the talent in the fine-dining restaurant. The restaurant is stunning, columns evoke the historic past, blended with modern, contemporary elements to give it a fresh feel. Cut flowers grace the tables, recessed lighting and sconces softly illuminate, as well as the two walls of windows, one overlooking the attractive rose lined courtyard with a water feature and trees that sparkle with fairy lights, and one overlooking the street where diners can enjoy the ambience of the city. The courtyard is perfect for enjoying cocktails or dining al fresco for guests who prefer a more casual dining experience than the fine dining experience inside the restaurant. A few of the many highlights of our dining experience included their signature cocktail, the BeeTini, made with honey syrup harvested from their own rooftop bee hives, Honey Walnut Bread, Juniper Signature Crab Cakes, Grilled Spanish Octopus, House Pickled Beet with Chive & Tarragon Goat Cheese, Local Tomato & Burrata Cheese with Pesto Marinade, Baby Lettuce Blend, and Blood Orange Vinaigrette, Seafood Paella, and Cioppino. 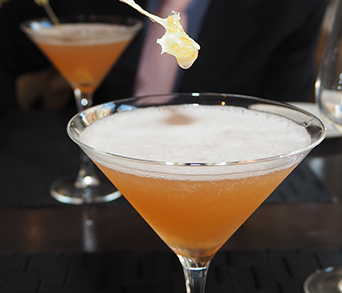 Read more about Juniper in the Restaurants section. Read the interview with Sous Chef Mitchell Eldridge of Juniper and get the recipes from Executive Chef Jordi R. Gallardi for Honey Walnut Bread, Chicken & Prosciutto Croquetas with Romesco Emulsion, and Gazpacho in the Chefs' Recipes section. 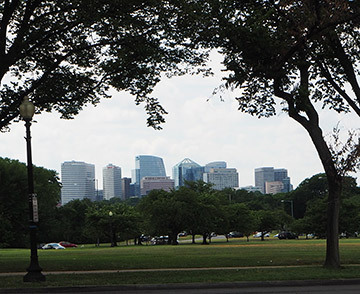 Washington, DC is a visitor's dream of a city with much to discover. We have visited this amazing city in all seasons, and it is always a wonder.